From one end of the world to another. Korea to Chile. That must be some flight to get there. My Brazilian friend, who returned home recently, had to make a couple of connecting flights in Japan and parts of America. But then again, she was stopping at a couple of festivals showing off her film. These festivals are in league with those folks at IMDB, so by default, you can check her out here. But I digress. Chile. Why am I talking about Chile? That’s where this film, ‘Tony Manero’, hails from. You might think that since it is named after John Travolta’s character in Saturday Night Fever, it might be set in the same country, somewhat. But if that is indeed what you think, you’d be wrong. Is he the one that you want? Somewhat a period piece, ‘Tony Manero’ sees events through the eyes of one man, Raul Peralta (Alfredo Castro), a man who is so obsessed with Travolta’s character that he watches practically every screening of ‘Saturday Night Fever’ at the cinema. 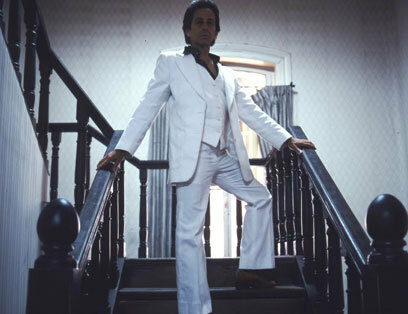 Such is the popularity of Tony Manero that there is even a contest of sorts, on TV, where people get the chance to don the suit and show off their best impressions of the man. It is this show that Raul aspires not only to enter, but to win and crush the opposition. Which leads to the second part of his nature: his wildness. He is such a complex character that even after I had walked out of the screening theater, I couldn’t really put my finger on it. Put it simply, he is a psychopath, a man driven by his own obsession and passion to the point where he is driven over the edge…which, I realise, is just another, more polite way of saying “PSYCHO ON THE LOOSE!” It is this obsession that makes his relationship with those around him even more strenuous then usual. His lover, Cony (Amparo Noguera), appears to sincerely love him in spite of his flaws, but instead, he has his eyes more set on her daughter, Pauli (Paola Lattus). Pauli, on the other hand, is involved with Goyo (Hector Morales), a man so anti-Pinochet that he does a lot insurgence activities on the side to protest. They are all linked to him, meeting with him on a daily basis to practice their dances together. Perhaps a part of the reason why they do is because there is something about the man himself, Raul. Quite frankly, in so many ways, he is a despicable person, but one that is made even more so by the previously-mentioned unpredictability. One minute, he’s helps an old lady, the next, he’s killing her to get her colour TV. It happens with such violence and force, and with absolutely no warning whatsoever (it’s occurs within…oh, maybe ten to fifteen minutes at the beginning, so it’s not really a spoiler, don’t worry). It absolutely shocked me. I was already about to get used to the dark colours of the film, but now I would have an even darker character to deal with. He would also be prone to intense moments of jealousy. The director, Pablo Larrain, highlights this cleverly with some longing shots here and there, looking on at Pauli as Goyo spends time with her. 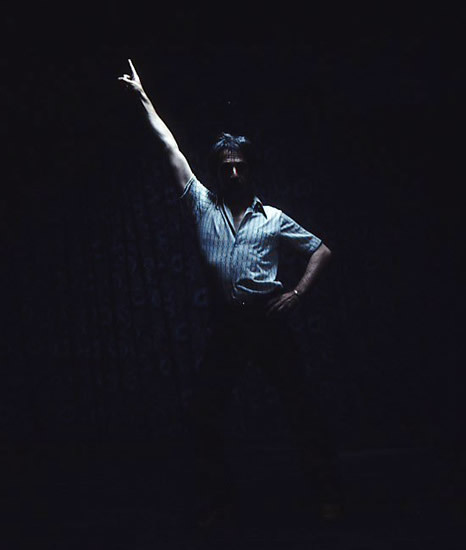 However, that jealousy evolves into something totally different when Goyo himself announces that he wants to compete on the Tony Manero competition on TV. Bad mistake. This pushed Raul completely, and it is absolutely compelling to see such fine acting. Then again, the film had little else working in its favour, but what a card it had to play in the acting. And in Alfredo Castro, what a card player they have. This is not an easy film to watch, not just in terms of the character they’re highlighting, but also with regards to the technical aspect of the production. It challenges you; dark, gritty, dirty, out of focus, rough…put all of this in your pipe, smoke it, and you still would only feel what I mean when you see this. But I managed to soldier on through to the end, thanks to Mr Castro. He does, truth be told, have one expression glued on from start to finish, but it is the underlying note that strikes me. Without ever truly changing, his progress as a psychopath is charted and projected for all of us to see. It’s the eyes, I suppose. I can’t really pinpoint it. Words couldn't express their disappointment with 'SYABAS'. 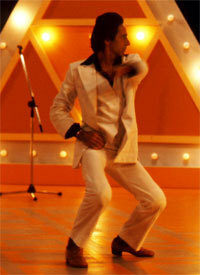 Mind you, he also did rather well as an impersonator of Tony Manero. He hits the moves well, he memorises the lines, he works that body language…that is not something that comes easily. I am guessing that he spent plenty of time perfecting this during the production and before, so kudos to him for that. Of course, kudos should also be given to director Larrain for managing to craft this nice little work of art. As I’ve written some time ago, I’ve not seen Chilean movies for a while. To be honest, I know little of the South American film industry, and even less about Chilean movies, a gap in my knowledge that I’m not entirely happy about. Then again, it’s not as if such films are a dime a dozen; you’d be hard pressed to legally find such films being let out into the world of general release in Malaysia, or even in Korea. I am impressed enough by the effort, and the effect. You do not escape the pessimism of the film; the air is weigh down with fear and repression. The camera follows Raul doggedly like a dog, and as such, while we rarely are afforded insights into the character, we do feel what he feels. He is, at the end of a day, a man. A man who feels inflamed by another male, the same one who has the prizes his heart is set on, as well as one who is threatening to take his dream away from him. He constantly feels that he has to do something, like there’s an energy balled up within him that can only be released by physically doing something. A man so obsessed that he specifically spent the last time he had on recreating the dance floor in Saturday Night Live…as exactly as he can. Even when he doesn’t seem to feel anything, you feel it. You feel the bump in your heart as he hides from the soldiers patrolling the streets. A deeper layer of understanding might be gained further if you are familiar with the history of Chile. Set in the time of Augustin Pinochet’s dictatorship in the late 70s, it is clear that there are some clever links to be made between Raul and the country itself. However, my conclusions are simplistic, at best: Raul terrorises those around him with fear and unpredictability to keep them subservient to his every whim. Make of that what you will of any underlying political statements. Do, however, pay the full admission price for Raul Peralta, a character so mysterious, psychotic, magnetic and wild that he’ll make you forget completely about Sixto Peralta. Fikri wonders if Sixto’s brother is Sevento Peralta. Which would actually sound like a name, no? This film is a part of Fikri’s Jeonju 10.